Home Others Microsoft Releases 4 Security Updates — Smallest Patch Tuesday Ever! Microsoft Releases 4 Security Updates — Smallest Patch Tuesday Ever! 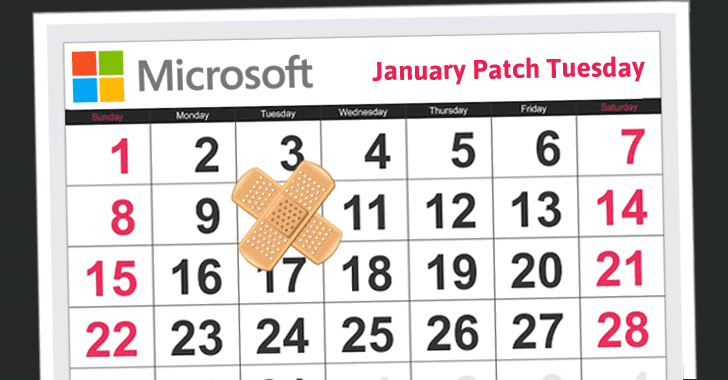 Microsoft has issued its first Patch Tuesday for 2017, and it’s one of the smallest ever monthly patch releases for the company, with only four security updates to address vulnerabilities in its Windows operating system as well as Adobe Flash Player. Meanwhile, Adobe has also released patches for more than three dozen security vulnerabilities in its Flash Player and Acrobat/Reader for Windows, MacOS, and Linux desktops. According to the Microsoft Advisory, only one security bulletin is rated critical, while other three are important. The bulletins address security vulnerabilities in Microsoft’s Windows, Windows Server, Office, Edge and Flash Player. This security update resolves just one vulnerability in the Microsoft Edge browser. Microsoft rates this bulletin as important. The vulnerability (CVE-2017-0002) could let an attacker gain elevated access privileges by tricking users to view a specially crafted web page using Microsoft Edge. This elevation of privilege flaw exists in Microsoft Edge’s cross-domain policies, which could allow "an attacker to access information from one domain and inject it into another domain," Microsoft says. The update will be rolled out to Windows 10 and Server 2016. This security bulletin is the one that also patches a single vulnerability in Microsoft Office. The vulnerability, designated CVE-2017-0003, is a memory corruption issue that allows an attacker to perform remote code execution (RCE) in Microsoft Office 2016 and SharePoint Enterprise Server 2016. The flaw lets a specially crafted Word file to take control of the target machine with the current user’s access privileges. This security bulletin is rated as Critical and resolves 12 security vulnerabilities in Adobe Flash Player for all supported editions of Windows 8.1, Windows Server 2012, Windows Server 2012 R2, Windows RT 8.1, Windows 10, and Windows Server 2016. The security patch will be automatically rolled out to Windows users running Microsoft Edge or Internet Explorer 11. This security update, also rated as important, addresses just one denial of service (DoS) vulnerability in Local Security Authority Subsystem Service (LSASS) for Windows Vista, Windows 7, Windows Server 2008, and Windows Server 2008 R2. The flaw (CVE-2017-0004) resides in the LSASS that handles authentication requests, which could be exploited to reboot the system by sending a specially crafted authentication request to the targeted system or server. A total of 13 vulnerabilities has been addressed in the Flash Player, while none of the flaws have actively been exploited in the wild. The Flash Player updates for both Windows and macOS systems have been rated critical, as successful exploitation of the vulnerability could let an attacker perform remote code execution on the target system. However, Linux users are at lower risk for attack. The update for Adobe Acrobat and Reader addresses some 29 flaws, including some remote code execution (RCE) vulnerabilities in both Windows and macOS. Users and IT administrators are strongly recommended to apply Windows and Adobe patches as soon as possible in order to keep away hackers and cybercriminals from taking control over your computer. A system reboot is necessary for installing updates, so users are advised to save work on PCs where the whole package of patches is deployed before initiating the process.